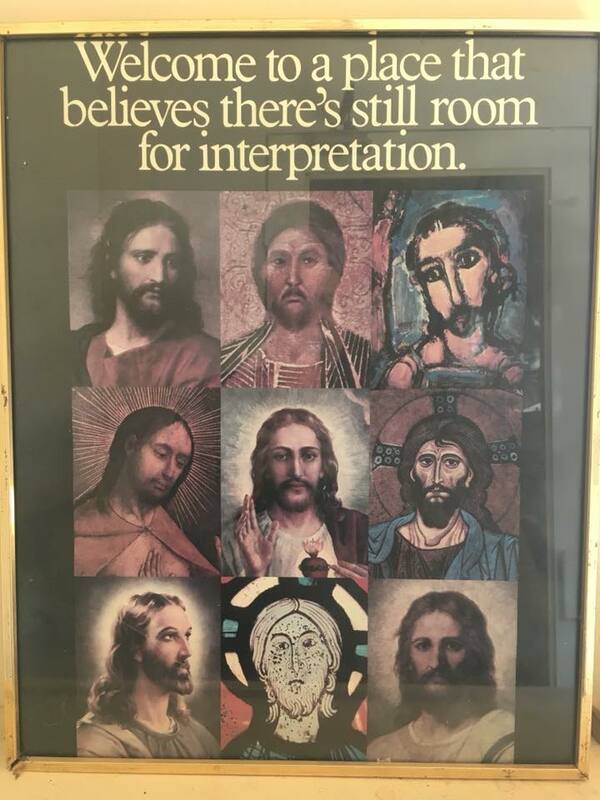 I was remembering the poster my youth minister had in her office when I was growing up — multiple images of Jesus, with text that stated: “Welcome to a place that believes there’s still room for interpretation.” I’d always been fascinated by that poster, and now, twenty years later, I wanted a copy of my own. But a Google search turned up nothing. I contacted my former youth minister and we figured out likely came from the Episcopal Ad Project in the 80s and 1990s, part of a collection produced by Tom McElligott – a Minneapolis copywriter and son of a preacher, who’d get so anxious before client presentations he’d vomit. (I love this story. Tom sounds delightful.) Another friend had a framed print, and snapped a photo for me (see right). 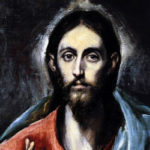 But I couldn’t find a high-res copy, and the original, while beautiful, centers white and Western expressions of Jesus. 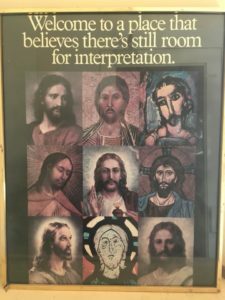 No collection of Jesus portraits can fully capture the expression of Christian faith throughout time and space, but here is what I have tried to do: I’ve tried to diversify through time, including the contested Shroud and some of the oldest icons and stained glass on record, as well as modern depictions. I’ve also tried to diversify through cultural expression, including black/African-American, Chinese, Ethiopian, Native American, Brazilian-inspired Art Deco, and a female Christ. I’ll admit openly I am not an art scholar and I’ve surely missed things or chosen poorly in one way or another. I wanted to make sure I had sources for all of the portraits, especially non-Western. 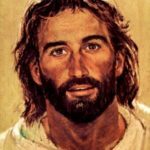 There are a number of supposed portraits of Jesus that I couldn’t easily find attribution for via Google. The Chinese Jesus in this existing collection, for example, shows up in searches for “Chinese Jesus,” but I could not find an artist or an era. I also wanted to be have images that with high enough resolution that Jesus’ face filled the box. 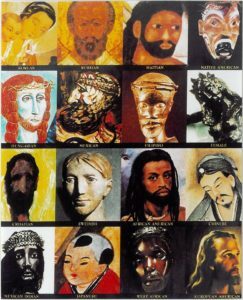 This eliminated (and I struggled with this for a while) the modern Korean depictions of Jesus by Woonbo Kim Ki-chang, because the only images I could get were low resolution and frequently depicted Jesus’ profile rather than head-on. I did not easily find a Latinx/Hispanic Christ that didn’t seem heavily anglicized (the predominant result for “[Spanish/Hispanic/Latino] depiction of Jesus” is that horrific botch job “Ecce Mono” from 2012). I used Father John Giuliani’s image for a Native American Jesus, but Father Giuliani is using an iconographic style to depict Native imagery. 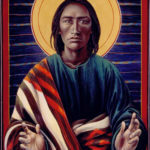 I welcome a suggestion for a Native artist depicting Jesus in a more true-to-origins way. I welcome suggestions for correcting other gaps. 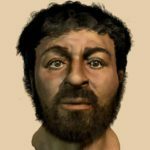 Richard Naeve, a retired medical artist with expertise in historical reconstruction, created this image in 2001 using forensic anthropology as a best guess at what Jesus would have “really” looked like. 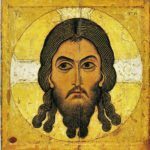 This is a Christ Pantocrator icon found at St. Catherine’s Monastery at Sinai. It is one of the oldest surviving Byzantine icons, likely from the 6th century. 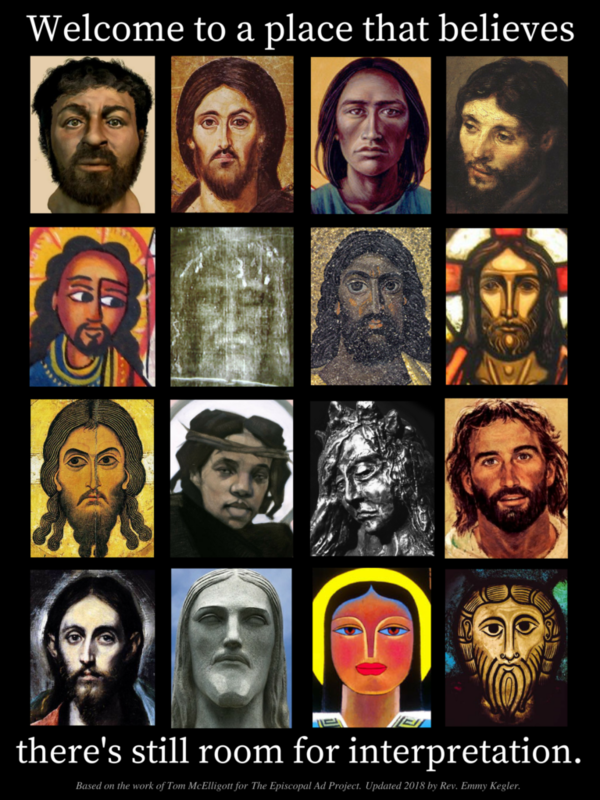 The marked difference between the two halves of Jesus’ face is theorized to represent the fullness of his humanity and divinity; others think it may be God’s judgment and God’s mercy. The Compassionate Christ by Father John Giuliani. Giuliani has attempted in his artwork to capture Native American tribal markers (here, the clothing is Navajo) in a style resembling Orthodox iconography. The Head of Christ by Rembrandt, from 1648. Rembrandt, unlike many of his peers, used a Jewish model and attempted to capture the humanity of Christ. 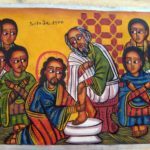 An Ethiopian Orthodox depiction of Jesus washing the feet of his disciples. An Ethiopian was the first non-Jewish person baptized into the Christian faith (Acts 8:26-40). 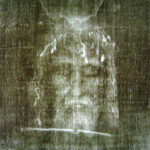 A photograph negative of the Shroud of Turin, a highly debated cloth dated at least to the Middle Ages, whose proponents claim it is the original burial shroud of Jesus and has his face mystically imprinted on it in negative. A close-up of the mosaic at Santi Cosma e Damiano, a Roman church built in the 6th century. 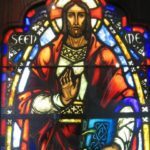 A Western stained glass image of Jesus, source unknown. “Christos Acheiropoletos,” meaning Made Without Hands. An icon from the Assumption Cathedral in Moscow, from the 11th century. 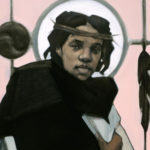 “Jesus of the People” by Janet McKenzie, incorporating Eastern (yin-yang) and Native (feather) symbolism into a black image of Jesus. 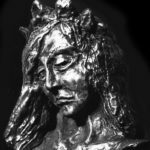 Detail from “Christa,” a sculpture portraying Jesus as female, by Edwina Sandys. 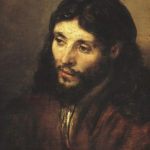 A common Western depiction of Jesus, “Head of Christ” by Richard Hook. “Savior of the World” by Domenikos Theotokopoulos, aka El Greco, from the 16th century. 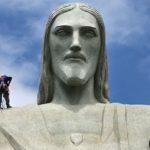 The face of Jesus from “Cristo Redentor,” the 30-meter-tall statue overlooking Rio de Janeiro. 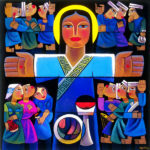 “Risen Lord” by He Qi, a Chinese artist, from the early 2000s. “Head of Christ” from the Abbey Church of SS. Peter and Paul in Wissembourg, 11th century. 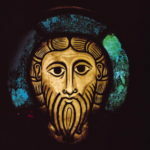 One of the earliest examples of stained glass. Printable File: Download a PDF suitable for an 18″ x 24″ poster here. Emily, will you be marketing high-quality copies of this? I may be able to help or to distribute them. Randy, thanks for asking. Because some of these are selections from artists who own copyright on their work, I will not be selling any prints. Is it an infringement on anyone if I download, print, frame, and hang in my church? This is beautiful! I appreciate how it shows us in a new way we are all made in the image of God. Thanks so much for providing attributions and links to the original! Very useful tool to provoke class discussion.